Eat sheet, Bill “doesn’t want a perfect season” Polian. 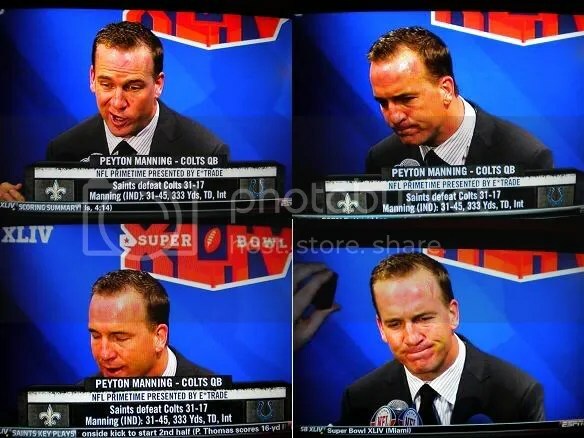 And, most importantly…eat sheeeeeeeeeeeeeeeit, Colts fans. This entry was posted on February 7, 2010 at 11:04 pm and is filed under Hating, Ravens. You can follow any responses to this entry through the RSS 2.0 feed. You can leave a response, or trackback from your own site. BEST POSTING EVER!!! I love to watch those horses asses lose and I love Clay Davis! I can’t wait to see the Payton Manning interception commercial!! I don’t what I enjoyed more. Stover shanking the kick or Peyton’s pick 6. The only thing that would have made that interception better if somebody knocked Peyton out of the game. Like the Saints did with Favre and Warner.